I am a coffee freak. So what is better than having a coffee drink and getting your protein too? When I found CLICK I was super excited to try these. Everyone knows I am trying to lose weight and these have been a lifesaver in the morning. 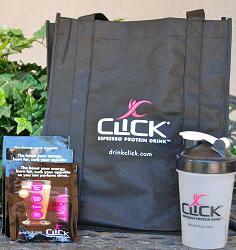 CLICK was founded by Greg and Beth Smith who owned a chain of womans fitness centers in California. They were seeking a delicious, healthy beverage for their members in response to the growing wall of sugar based energy and coffee-house drinks on the market. Their simple solution – a delicious, all-in-one, espresso coffee, protein drink – that makes you feel that you are doing something good for yourself one cup at a time. I was blessed to receive a sample of their Vanilla and Mocha drinks and a CLICK shaker to mix them with. These drinks really pack a punch. Not only do they taste like coffee they pack in 23 different minerals and 15 grams of protein. That is what I call breakfast on the go! My favorite of the two was the mocha. I have never been a vanilla fan but it was still very yummy. I had them both as cold drinks but they would have been just as wonderful hot. I preferred them with less water to make them a bit thicker. Blended with ice would have been great too. For more recipes check them out here. CLICK is giving one of my reader this fabulous gift package. It includes a tote, 2 single servings packages of each flavor, and a blender bottle. This is valued at $30! Thanks CLICK! I love to use my click blended with ice. It’s hot here in Texas.